This year my daughter and her friend planted basil on Earth Day back in April. They planted the basil from seeds and and it grew into large basil plants. To use it up I decided to make Pesto Sauce. Below is the basil planted from seeds and it grew so big. 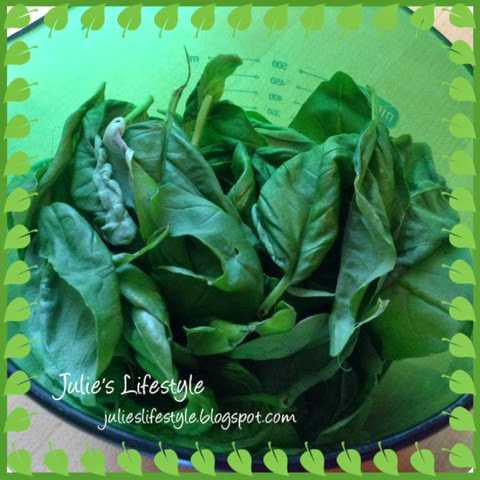 I picked 2 cups of fresh basil leaves to make the pesto sauce. 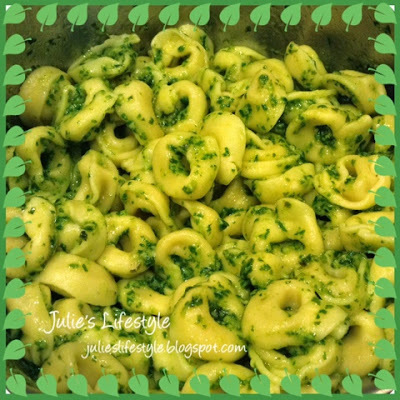 I made tortellini pasta with the Pesto Sauce. You can use any kind of pasta you like! This pesto sauce tastes so amazing and I made it for my family two times already! Combine all the ingredients in a food processor or blender and pulse a few times. Stop and scrap down the sides with a plastic spatula. Done. I am excited to try this out, I have always wanted to make pesto sauce! 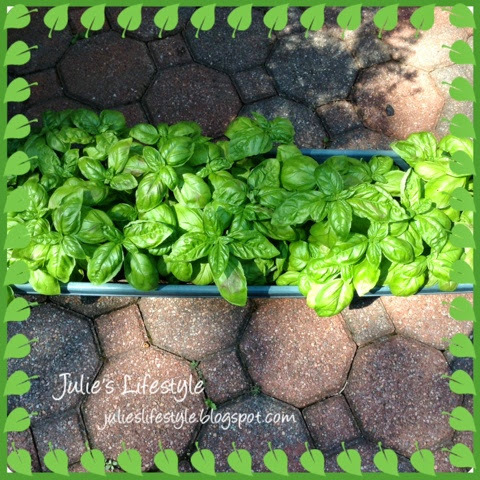 We love fresh basil so I'm sure we would love this. I've never made it but now I want to try it! Would be so great fresh out of the garden! Hugs! Oh I love pesto and will have to try your recipe. I love ther mix a bit with mayonaisse to make pesto may and use it on paninis. A little pesto mayo, a couple slices turkey, muenster cheese, and roasted red peppers...yum! I love them. Thanks for sharing! Have a wonderful Wednesday. Oh this looks so good. I love Basil. Thanks for linking your fun tutorial at Count Down to Christmas. That was a great idea to share that. I would love to make some for my kids at school. See it isn't too early to think about it! Gives us time to get things done! Thanks for linking. Come back next week. Tell your friends! Oh I wish there was a taste button on my computer! :) Thank you for sharing. My son's MIL made us pesto for a holiday gift last year. Oh my my my, that was GOOD!! I love pesto. Thanks for sharing your recipe! How delightful that you daughter grew the basil that you are creating this amazing dish with! It must mean a lot to her to enjoy meals made with her basil plantings. 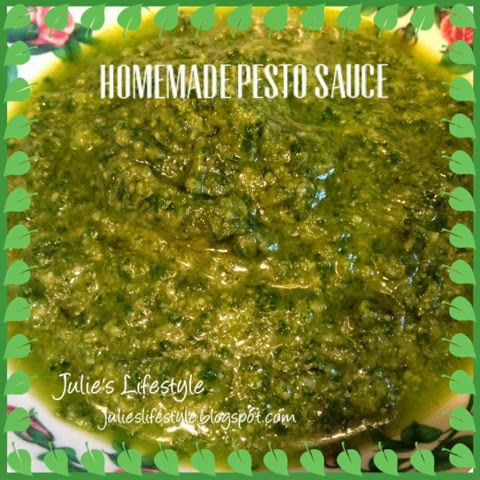 Thank you so much for sharing this healthy and delicious homemade pesto sauce recipe at the Plant-Based Potluck Party Blog Hop! I am pinning and sharing this yummy recipe! Thank you Julie! Now I know what to do with my extra basil. It looks delicious. Love a good pesto. It makes your pasta taste so much lighter and fresher for a summer meal. I have so much basil growing that I am going to be making some pesto soon. Thanks for the recipe and linking up to the Be. YOU. tiful link party! Good Morning Julie, I love pesto and like your daughter, I grow a lot of basil to use in my cooking and to make pesto. Basil is an amazing plant, given the right conditions it just grows and grows. Some years the plants yield a lot of basil and other years not so much..... it is all down to our English weather. Have a lovely weekend.....can you believe it is 1st August.... where did July go? My Gramma use to make this, and the recipe was lost and now you've shared it. Thank you sooooooooooo much! I have a Recipe linky on Friday. Won't you share yours with my readers too? Looking forward to seeing you there. Have a nice weekend. I used to make this when I was a cook at the hospital for patients. I never tried it personally. I grew up in an Italian neighborhood and Irish too. 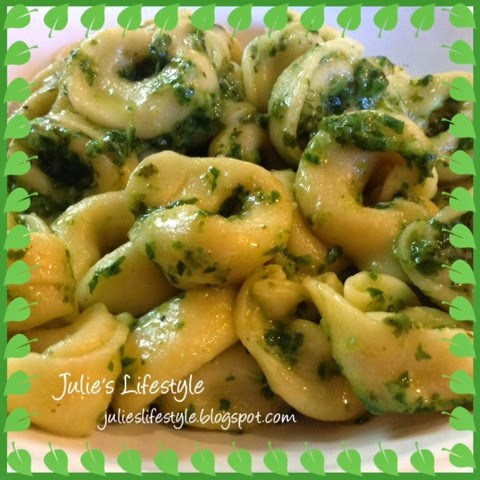 Therefore, I adore Italian food and now I'm dying for this cappeletti with pesto sauce...almost my fave! Thanks for sharing sweet friend. I love Pesto! Pinning this Julie. My pest usually does fabulous, but not doing that well this year. DARN! thanks for sharing with SYC. I never knew how to make this Julie! Looks so good! Thanks! The sauce looks amazing! Way better than what I get in the jar, LOL! Thanks for sharing your recipe, now I can make fresh. And thank you so much for stopping by to see my crocheted rug. I appreciate your comments. Have a wonderful week! I absolutely LOVE pesto! YUM! I love fresh basil! The plants do get so big that I've dried mine for potato soup in the winter. I'll have to try this recipe. Thanks for sharing with Creative Spark Link Party, I hope you'll join us again tomorrow. Yummy pesto! I would love to try this! OOH! I love this. I have basil in my garden and this pesto doesn't call for nuts, which we can't have. Pinned and ecstatic! Thanks. Beautiful basil! Mine didn't come up so well this year. I'm going to try again! Thanks for sharing with the Merry Monday Linky Party! This sounds great and so healthy. Thanks for sharing on Real Food Fridays. Pinned & twitted.